The Red-cockaded Woodpecker was once common throughout the pine forests of the American Southeast, but today is listed as a federally endangered species. 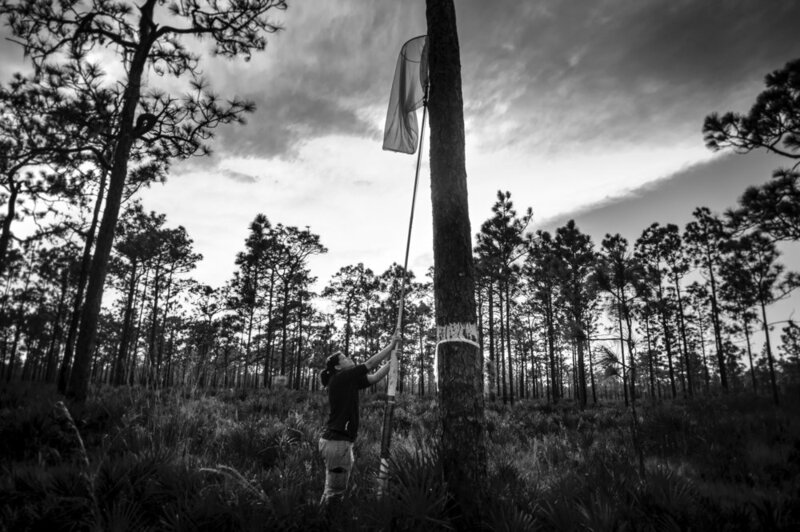 The loss of 97% of the longleaf pine forests, along with fire suppression, left them with little habitat left. Fortunately, science based management and the collaborative efforts of agencies, non-profits, and private land owners are successfully restoring the species. Wildlife biologists working with Red-cockaded Woodpeckers sometimes capture and move individual birds to vacant tree cavities in areas with good habitat. This technique, called translocation, moves birds from locations hundreds of miles apart or within the same property. Biologists choose young non-breeding birds without partners and move them to nearby trees, hoping they will form a pair and breed. 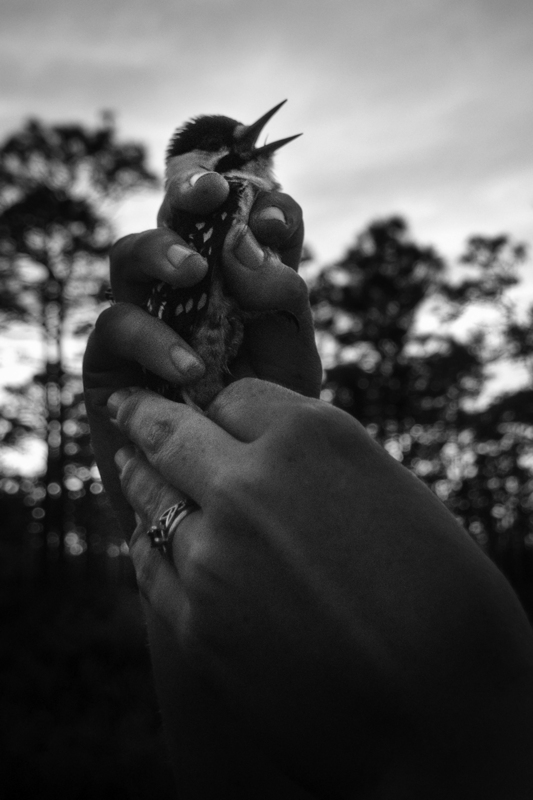 Translocation has proven an effective way to increase woodpecker numbers and restore populations into areas which once supported the imperiled species. 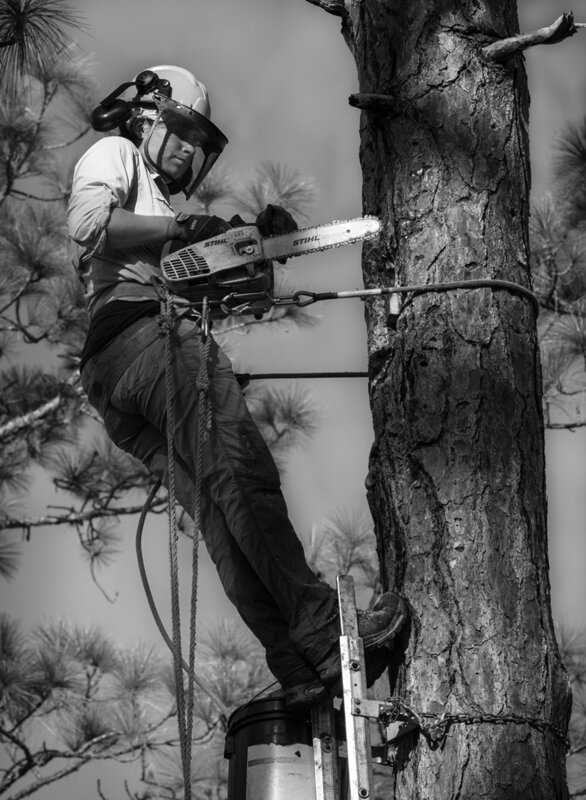 After waiting for the bird to come home to roost for the night, biologist Emily Angell sneaks up to the tree with a net she sets against the bird's tree cavity opening. 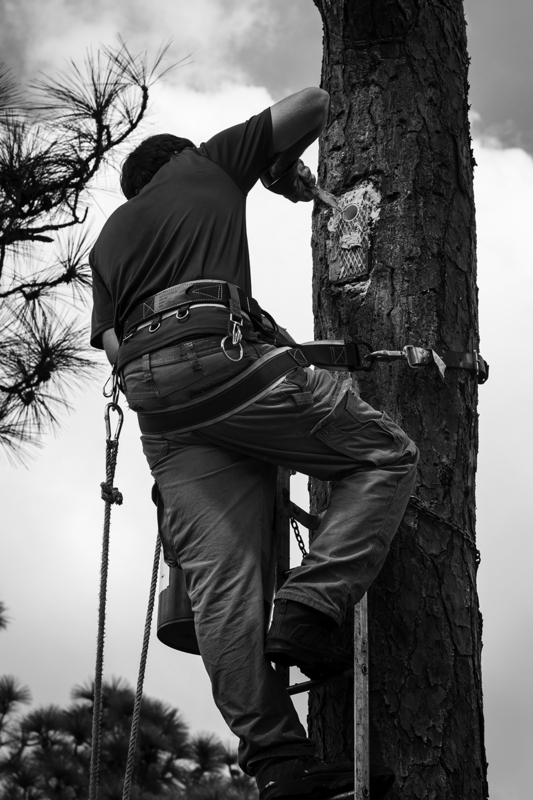 Another biologist makes noise and climbs the tree in order to get the bird to leave its roost and fly into the net. Emily double-checks that she has the right bird and places it into a wooden travel box for the translocation. Another team catches its potential mate. 30 second exposure lit with flashlights and headlamps. To limit stress to the birds, they are immediately brought to their new homes in nearby trees. Emily installs a temporary screen over the cavity opening that will ensure the bird's safety for the night. In the morning, the biologists will take these covers off and the new pair will meet for the first time. If they mate, they may partner for several years. Red-cockaded Woodpeckers are unique in that they are the only woodpecker to nest in live trees, excavating cavities in longleaf pines. Due to extensive habitat loss from land conversion and earlier clear-cutting practices, not many of these trees remain. Even thought today forests are better managed, not many old trees remain. This is a problem, because the tough inner wood of today's younger trees make it very difficult for the woodpeckers to excavate into cavities. Fortunately, the birds will readily use artificial cavities installed in the younger trees. Working in teams of two or more, biologists install new artificial cavities or replace old ones.